For Orchestra – 2(2 dbl. Picc.) 2 2 2 – 4 2 3(B.Tbn.) 1; Timp. 2Perc. Str. Premiere: January 13, 14, 2017. Austin Symphony, Peter Bay, conductor; Dell Hall, Austin, TX. The idea of an all-classical music radio station on the American FM band is a relatively new phenomenon. In the 1930s, 40s, and 50s, classical music was regularly featured on “regular radio”, with some networks even having their own in-house orchestras (the NBC Symphony under Arturo Toscanini being a prime example). But in the 1960s, local radio stations affiliated with the fledgling National Public Radio network began featuring classical music for at least part of the day, and some stations became “all-classical” for their entire broadcast day. The presence of classical music on the Big Networks slowly disappeared (on network television as well, which had been heavily involved with arts programming in earlier times), and classical broadcasting began to be seen as a niche audience. In some communities, it was not the NPR stations that went “all-classical”; it was a loose affiliation of local listener-owned radio stations who picked up the baton. Radio station KMFA (Classical 89.5) in Austin, Texas was one of those stations. Going on the air for the first time on January 29th, 1967 (with the rousing notes of Rossini’s WILLIAM TELL OVERTURE as the first piece broadcast), it originated in donated space with donated equipment and a volunteer engineer. Now, fifty years into its history, the station boasts a 24-hour non-commercial all-classical format that exists in a vibrant, rapidly growing community of over two million people. Still proudly independent (it is neither affiliated with the University of Texas nor with National Public Radio), KMFA has been able to maintain its integrity. It is one of a handful of radio stations in the USA that still plays, uninterrupted, entire symphonies—as well as broadcasts of the Metropolitan Opera, the Chicago Symphony, and a host of other regular programs from the leading cultural institutions of our time. When KMFA asked me to write a commemorative overture for the Austin Symphony to play in January of 2017, marking fifty years of classical broadcasting on the air, I decided to do more than just write another rousing short work to begin a concert. I took the four call letters of the station’s name and assigned them musical pitches: K (=C) M (=G) F, and A. These four notes, both in the original key and in every imaginable transposition, become a leitmotif organizing the entire overture. It begins with a fanfare, which ultimately relaxes into a gently singing melody in an undulating 9/8 meter. This melody begins with the KMFA theme inverted, with the intervals turned upside down: C-G-F-A becomes (in transposition) E-A-B-G, and develops from there. After a spun-out exposition, this theme gives way to a jumpy, playful 2/4 episode. When this second tune has finished, the first theme returns to round out the first half of the work. But it is in the second half that I took liberties with classicism and pre-ordained proportions. Where the normal sonata form would have a “development” section, re-working and playing with the two main themes, this overture becomes, in effect, an impatient radio listener—sampling famous pieces in short bursts to see what’s on. We begin with a tiny fragment of Mozart’s MARRIAGE OF FIGARO overture, but quickly morph into the ever-present KANON IN D by Pachelbel (an in-joke for classical music stations, since the Pachelbel Canon is widely seen as the most-heard piece during fund drives). The Pachelbel eight-bar mantra is repeated three times, with various other works overlaying it (and eventually destroying it) by Beethoven, Mendelssohn, Rossini (yes, the William Tell Overture), Bach, Richard Strauss, and more Beethoven— (much more Beethoven; three different symphonies are teased into the fabric). 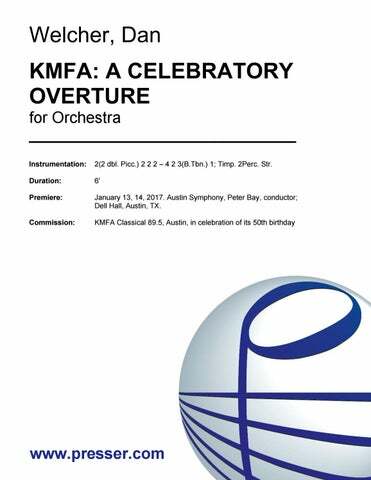 But through it all, the four-note KMFA theme is ever-present: a reminder that classical radio is essential, and that Klassical Music For Austin (and wherever else this piece is played) needs to be kept alive and vibrant. I am happy to have been associated with KMFA Classical 89.5 for many years now, and to present this overture to the world as a testament to my deep faith in classical radio—and in Beethoven.